DEFENDER2.NET - View topic - My Series 2a restoration thread. 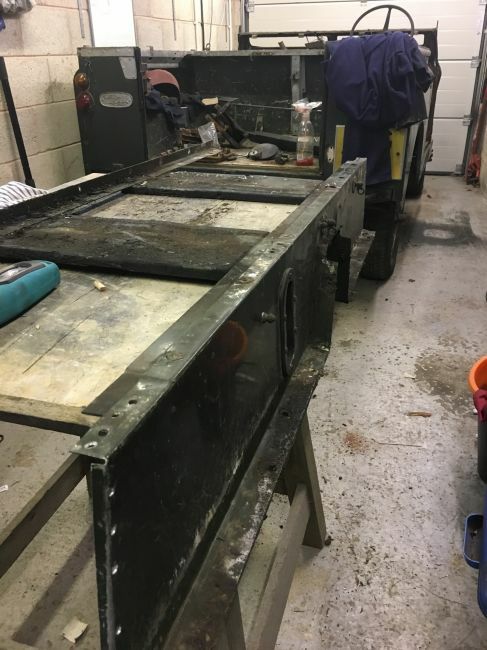 Home > Series Land Rovers > My Series 2a restoration thread. The cold start knob will have been the choke for the petrol engine. Diesel engines of that era (right up to the end of SIII) had a very similar knob that was pulled out to stop the engine - a manual fuel cut-off rather than the solenoids on later vehicles. It's highly likely that the cold start knob has been re-used for that purpose. The cold start light in the speedo may also have been re-used for the glow plugs but that is complete speculation. It all depends on how the conversion was done. Diesels also had a separate purple 'low fuel' light on the RH side of the dash, as running out completely was a big deal. Dunno how that might have been accommodated. Time lapse of today’s efforts. 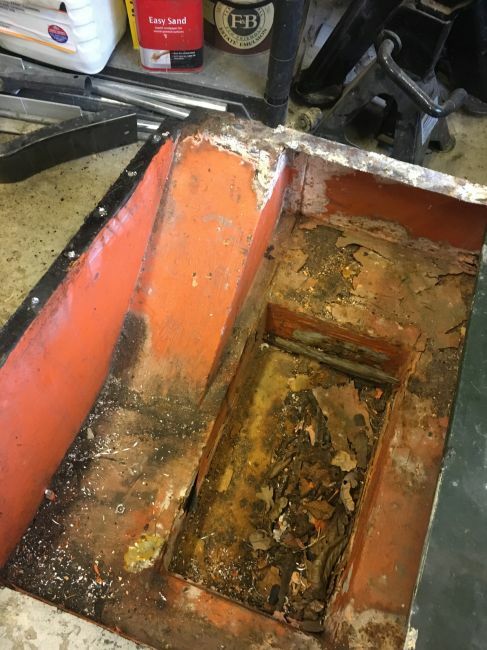 Mostly stripping off everything from the bulkhead. Not much done because weather was shocking and couldn’t roll it out. We want to get the rear tub off next, but need to roll it out for that. In order to find out the condition of the fitted diesel engine, and to help me decide whether to keep it diesel or revert it back to petrol, I needed to run the engine to determine its basic condition. I had already decided if there were any problems apparent that I would swap it for a petrol. So today we pulled the car out into the sunshine and got to work. First of all I had to enlist the help of my 109 S2a, Betsy, who very kindly loaned her alternator and battery to enable Bob (as he has been christened by my wife) to attempt a startup. Because I had already removed the heater unit, we closed both the valves that feed water to, and return it from the heater. Then filled the rad with water. Luckily none came pouring out so it seemed the cooling system was OK.
Once the alternator was fitted, and the battery connected we started to check all the controls. Most importantly the STOP control. We didn't want an engine that we couldn't shut down. The cable was seized, but nothing a bit of oil and a workout didn't fix. I took the sender out of the tank, and peered inside. It smelt like turps, and looked like it was half full of old chip fat!. I placed a container of clean diesel next to the tank, and immersed the flow and return pipes into it. The problem still existed that all the lines and filter would be full of old diesel, so we removed and drained the filter, then bled the system using the hand pump lever on the fuel pump. A pretty messy job, but once we got clean bubble free diesel from the bleeds, we were ready for a start attempt. Tentatively I held the accelerator to full throttle and turned the key. The oil and charge lights came on, then I turned the key to start. The engine turned over sweetly and after a few seconds it awoke from its slumber into a pretty smoky cacophony of diesel clatter! Brilliant we thought, and high five'd my helper, just as we did, it cut out. Damn!!! We decided that it probably needed another bleed, so once again bled the filter and the diesel injector pump. We tried again, and then the electric went dead ??? However it just turned out to be a loose battery terminal (I left them loose in case I needed to disconnect quickly in an emergency) Next time the engine turned over, and eventually burst into life and started to run smoothly. After 5 minutes or so, the idle became smooth and the engine started to warm up. I can't fault the engine, it seems to run very nicely, sounds like a typical diesel and seems to have no immediate faults of failures. To that end I have decided to keep it diesel. The engine will now be removed and cleaned up, new gaskets and a proper service. Next job, get the rear tub off. That will have to wait a couple of weeks, as I have been summoned for Jury Service for the next two weeks! Fantastic. Sounds exactly as I remember a 2 1/4 diesel should. 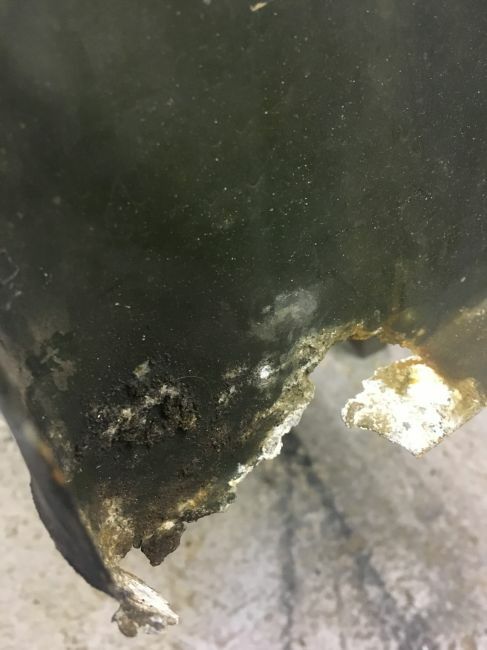 It's worth bearing in mind that with a manual stop and a mechanical fuel pump, once running it doesn't need the battery and disconnecting it wouldn't stop the engine. 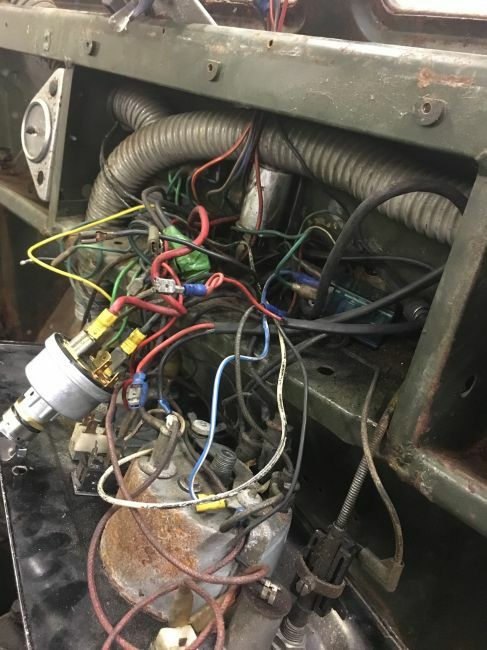 If it is machine-sensed alternator it would be OK, but IIRC the Lucas ACR series will self-destruct if disconnected with the engine running. The battery isolator/engine stop switch I fitted to my 86" also switches a shunt load onto the alternator when opened in order to prevent the Chernobylization of the alternator. Glad you have decided to keep the diesel Gareth. I'd like to say you won't regret it! 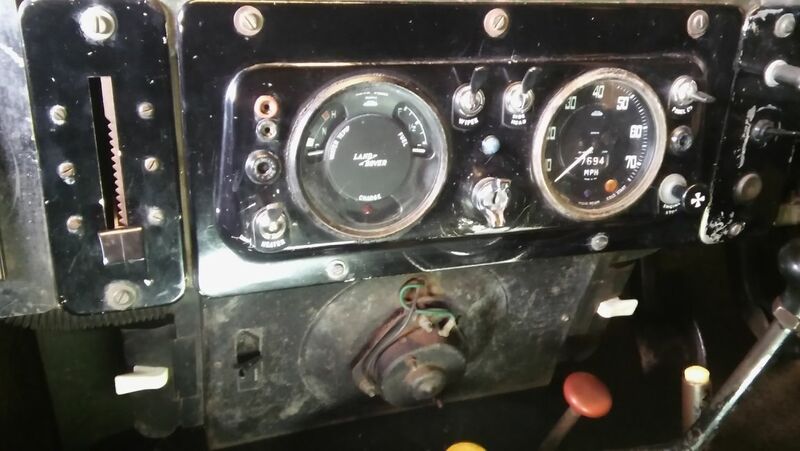 The knob at bottom RH corner is Engine Stop and I think you can still buy the appropriate label to go under the switch. The orange light in the speedo dial glows when you operate the heater plugs. It is labelled "cold start" as, I think, on the petrol version. (It also kills the other warning lights while it is on). On diesels of this era, the lpw fuel light was the "jewelled" type and in the centre of the dash. A hand throttle is standard on diesel versions and very handy to set a few more revs when starting from cold. I can't remember if your conversion included this. Thanks for all the comments. The conversion is done to S3 standard I think. There is no separate switch for the glow plugs, and it seems that they are energised as soon as you start to spin the engine. I know on an earlier 2a there was a separate switch and starter button. On mine it’s just an ignition on, then a spring retarded start position like on any modern car. There is no hand throttle fitted, but I do have a hand throttle lever and quadrant in my box of bits. I’ve been on jury service for the past fortnight, so not done too much. I have obtained the correct starter switch that has a separate glow plug energise position. Wired in tested and it’s great. As you can see the wiring leaves a lot to be desired, so an Autosparks loom is on order. 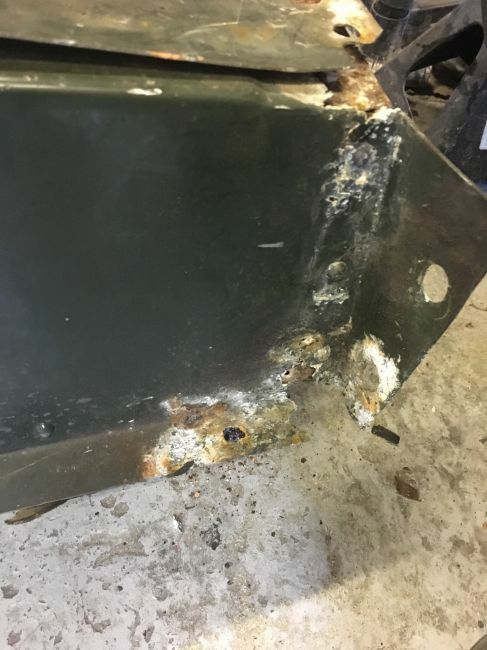 The seat box is corroded at the corners and the steel under seat battery tray was also corroded. 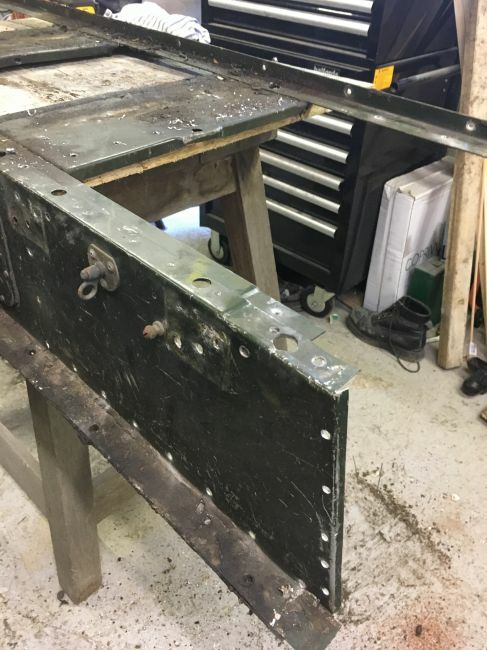 New end panels, under seat tray, and end finishers on order, so today spent an hour drilling out rivets and removing the old bits.